Don’t Pledge Like a Ferret! Some of you know that we recently adopted two ferrets. 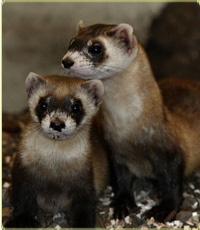 However, please know that we’re not not turning into eccentric “ferret people.” I’ve told my parishioners that if they ever see me walking Mimi and Caspar on leashes down Main Street, they’re welcome to form a new Rector Search Committee. I was especially concerned after watching a PBS documentary on ferrets and their owners titled “Ferrets: The Pursuit of Excellence.” It followed several ferret enthusiasts preparing to show their ferrets at the annual Buckeye Bash — the largest ferret show in the country. If I had seen this two days before adopting our new pets rather than two days after the fact, we might have guinea pigs or turtles or whatever. Although the boys were relentless in their pursuit of ferrets and ferrets alone (thanks again to our friend Jen — watch your back) so I don’t think it would have turned out any other way. Now I admit that they are very cute and playful. And I love the fact that they sleep for about 20 hours a day. But there’s a fine line between being devoted to your pets and being, um, insane. Particularly memorable was the ferret lady who writes and sings songs about her ferrets. Click here for a sample. Again, if I ever start composing St. Francis Day hymns about ferrets, kindly have me taken away by a pair of burly acolytes dressed in white albs. It would be for the best. 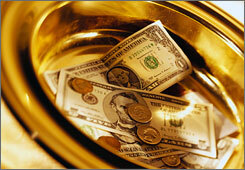 Most clergy have financial stewardship on their minds this time of year. I’m no exception which is why yesterday I offered you, dear reader, “A Dozen Ways to Avoid Stewardship.” But I’ve also been thinking about stewardship in light of my new status as crazy ferret owner. One of the characteristics of ferrets is that they exhibit some hoarding behavior. They like to stash things away whether it’s food or socks or keys. The good news is that they tend to ferret things away to the same location every time. So if you can’t find your remote control, it’s likely to be found in the same place where they’ve stashed your left slipper. Now, I don’t have such practical problems at this point because it’s not as if we let them run amok in the rectory. They live in a giant mansion of a cage in our family room that is actually larger than married student housing at most seminaries. Sure we let them out into a caged play pen and let the boys interact with them in there but they won’t ever have free reign as do some of the ferrets in the documentary. But as I’ve thought about our relationship to money in this context, one thing has become clear — it’s hard to be in a fruitful relationship with God when we act like hoarders. Money is ultimately a gift to be shared rather than a resource to be hoarded. Which is why I find myself telling people not to approach stewardship like a ferret. A right relationship with God involves a generosity of spirit which can never be fully realized by literally or metaphorically hiding all your money under the mattress. So that’s the message this year — don’t pledge like a ferret. And if you find yourself overflowing with generosity, feel free to send a check to the Rector’s Ferret Fund. Mimi and Caspar thank you. Three words: Best in Show. Your ferret show, and then some.